Penguin Random House has partnered with STORY at Macy’s, the narrative-driven retail concept shop, bringing to life an editorial approach to retail in 36 Macy’s stores nationwide. 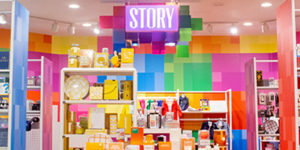 Opening with “Color” as its inaugural theme, STORY at Macy’s invites customers to explore and experience color through a rainbow of curated, giftable products, including a wide range of books from across Penguin Random House’s imprints. Starting on April 10, Penguin Random House joined this initiative, which will continue with new themes in the future. During this phase, STORY at Macy’s features more than 50 different PRH titles in such genres as cooking, wellness, games, and more. For further information, check out this website, which includes STORY locations in New York, New Jersey, Pennsylvania, Washington, DC, Ohio, Kentucky, Indiana, Illinois, Georgia, Florida, Minnesota, Texas, Nevada, Washington, and California. If you do visit a location, we encourage everyone to take pictures, tag the Instagram account @story and use the hashtag #STORYatMacys hashtag across social media platforms!